Commercial agriculture has driven land use changes and not only affected millions of hectares of forested land, but also farmers’ and local people’s land rights. Efforts to combat deforestation are at the forefront of the international aid agenda, and clarifying and securing land rights is important for its success. In October, partners of DfID’s Partnerships for Forests (P4F) and LEGEND programmes came together to assess, identify overlaps and learn from each other’s experiences regarding the roles of companies, communities and governments in promoting responsible agricultural investments. This blog follows up that discussion and provides context for the presentations available at the bottom of this page. What is the business case for companies? It can often be difficult to lay out the business case for companies to safeguard land rights in their supply chains. Evocative, consumer-led efforts to reduce deforestation have been successful in changing company behaviour. But companies also face significant risks from land rights disputes affecting disruptions in their supply chains. As LEGEND’s responsible land investment pilot projects in forest areas of Africa have found, the limited availability of forest land for logging and large-scale plantations is also forcing a change in corporate strategies to encourage collaborations with smallholders, a topic discussed at the 6th UK Land Policy Forum in July. This has resulted in a number of company-led initiatives to engage more closely with farmers and communities with insecure land rights, to find solutions, bring stakeholders together, map local land holdings, plan land use solutions, create jobs and foster community enterprise based on sustainable forest land and resource use. This is exemplified by investments in Ghana by French coffee and cocoa trader Touton and UK-based Miro Forestry. 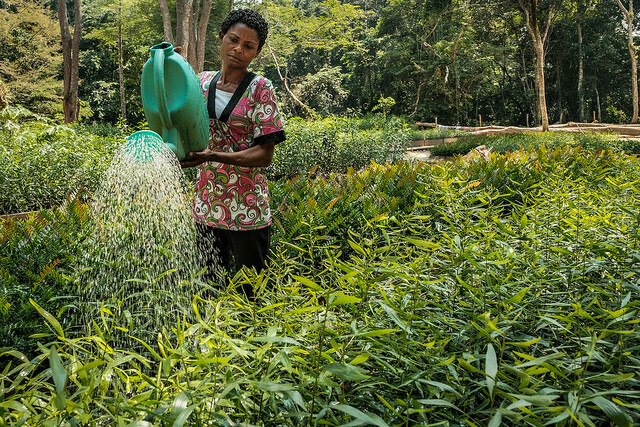 Amplifying and replicating such examples could lead to broader private sector partnerships for sustainable economic development across Africa’s forest landscapes. Nonetheless, financial, social and environmental returns need to materialise to sustain such efforts. This is as relevant for communities and governments as it is for private agribusiness. Done successfully, communities can benefit from increased incomes, reliable buyers and the availability of training, inputs and working capital, illustrated by Touton’s approach to develop rural service centres. One way to help empower communities at scale is by participatory mapping of existing land rights, areas of interest to companies and for conservation. This can help identify potential conflicts and opportunities on both sides and is a first step towards the legal recognition of land rights and a basis for negotiation between communities and companies. Participatory mapping can put communities at ease over leasing out underutilised land and at the same time assist companies in gaining the social license to operate and make long-term commitments. This shouldn’t hide the huge challenges that remain, including how to build community capacity to partner with investors and develop local solutions to help manage land and land rights. How to scale up successful capacity-building initiatives, such as Namati’s community legal empowerment programme, remains a challenge. It is also worth noting that areas with high conservation value are often also those with the highest productivity for local farmers. Further demand- and supply-side measures are often required to guarantee land rights and environmental protection. Ethiopian Wild Forest Coffee is one such example in demonstrating how improved markets can increase the value of agricultural products and at the same time protect forests. Governments also need to play their part to provide a policy framework in which communities and companies can work together, create a basis for registering smallholder farmer and community rights and reduce incentives for farmers and companies to remove and degrade standing forests. The need for stronger policies to prevent deforestation is highlighted by the fact that over 40 million hectares of land in the Amazon Basin can still be legally converted. Stakeholder collaboration in land-use planning, for instance through Landscape Management Boards pioneered by P4F and Touton in Ghana, can go a long way if they have the legal mandate to enforce rules, and good technical support is available. TFT’s Centre of Social Excellence provides a further example of how to cultivate necessary skills and capacities among companies and governments in addition to communities. Combating these issues requires jurisdictional landscape level approaches that are already on offer through various roundtables, however they remain restricted to just a few sectors, notably oil palm (e.g. RSPO) or cocoa (e.g. COCOBOD). It is also worth mentioning Bonsucro’s efforts to promote land rights in the sugar sector or P4F’s commodity ecosystem approach, which combines private sector partnerships with enabling conditions and demand-side measures to guarantee price premiums to achieve sustainable and deforestation-free cocoa in Ghana. Challenges remain, particularly around weak policy frameworks and in sectors where consumer pressure does not apply, such as rubber or timber. We also need to remember that women remain largely absent from negotiations and that secure ownership rights for indigenous people and forest communities are critical in preventing the loss of undisturbed forests and reversing existing degradation. These examples highlight the multifaceted nature of the underlying issue behind the drivers of deforestation and the erosion of land rights. The only way to tackle these issues simultaneously is through coordination. Consumers cannot change the behaviour of companies that are so far up the value chain that they fall out of the public eye. Likewise, companies cannot by themselves finance initiatives that require bridging long pathways to impact without changes in the structure of finance. In general, finance programmes need to promote global landscape-level public-private partnerships to support the use of participatory land-use mapping whilst also forging relevant policy change in the legal documentation of land rights. Coordination therefore remains crucial, not only between land rights and deforestation communities, not only between land rights and deforestation communities, but between governments, companies, international NGOs and especially local civil society organisations. Written by Joe Feyertag and Julian Quan, LEGEND. To find out more about LEGEND, click here.